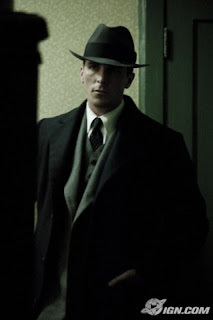 Public Enemies, like every gangster movie, contains dirty rats, and requires us to be sufficiently open to a Robin Hood point of view to hope secretly that the dirty rats get away with it. We are fascinated by damaged people and evil, but faintly slimed for taking an interest at all. Actually we know the world would be an infinitely nicer place without Bonnie and Clyde, or whoever, but can’t help wondering why they did it. We identify with them as a means of reassuring ourselves we are really not at all like them. And people, especially sixty years ago, loved to see authority made an occasional monkey of, as long as we don’t get mugged on the way home. That’s where the fun and fascination would end. For those who miss James Cagney Jr and wonder when comes such another, Public Enemies is a beacon of fun and hope. This movie is tough and occasionally nasty, repellent but not revolting. Some may not even notice Michael Mann’s decision to make the movie on HD Video rather than the stuff you take to the chemists, but I was fascinated by the result. With HD-V there's more detail on the plate, and what I can only call a slight dark steel, bluish sheen around night scenes in the woods or down the dives of Chicago. Lighting the movie was a challenge — the best boy must have enjoyed the experience. I hazard a guess that low available light registers more readily and across a different part of the spectrum on HD-V. The whole effect, which ought to look more natural, actually looks more contrived, but approprate. It’s grittily detailed, ideal for old time dirty rats, and the dolls don't have the slightly airbrushed look Celluloid gives them. The result is rather documentary, an impression reinforced by the use of steadicams and low angles, putting us where the action is. 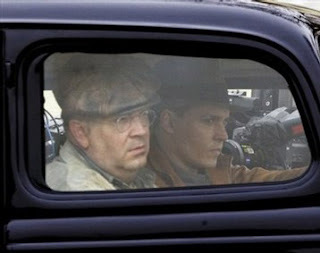 Johnny Depp does his rough diamond thing perfectly. Cap’n Jack Sparrow had a streak of Ronald MacDonald that was fun for about ten minutes but wore a bit thin over two hours with people over 12 years old. 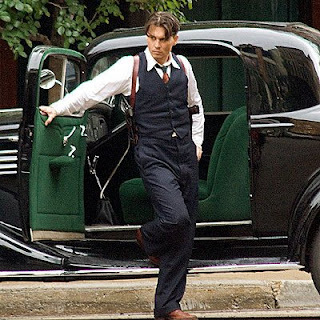 Depp’s Dillinger is an altogether deeper and more complex kind of psychopath. Marion Cotillard plays the faithful Moll faultlessly, providing excellent and absorbing chemistry between the principals. Much as we know that the whole ruddy lot should be strung up, we are glad to come along for the ride, even with its repellent occasional violence, and slightly sorry when it’s over. That’s the sign of a first class gangster movie. Placing itself in historical context, the film stays clear of O level sociology, and wisely majors on characterisation. J. Edgar Hoover is, like everyone else in this film, perfectly sketched — a scientific beureaucrat struggling to organise clearing raids into a jungle where the public representatives are as dodgy as the public enemies. Christian Bale is the sharp end of the feds’ operation. He’s sincere and occasionally frustrated to find himself as one of the good guys, unable to be as nasty as the bad guys. Amidst a sea of clean-cut but essentially expendable G-men, his Agent Purvis conveys, perfectly, a sense of being a brighter man than his profession requires him to look. None of this is revolutionary, on a narrative level, but it’s perfectly executed and it works. If your idea of summer fun is Year One or Hannah Montana this will not float your boat. 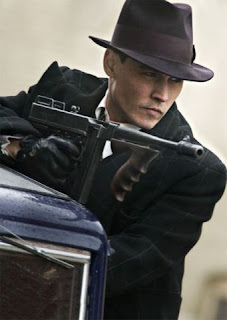 For those of us who prefer Dark Chocolate to Milky Bar, Public Enemies is absorbing, well-paced and characterful. 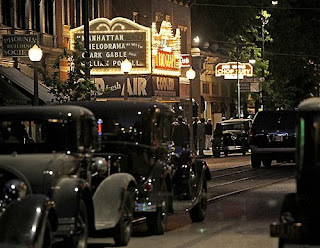 For all the film’s occasional nastiness, it’s reassuring to know the midwest is not as flat and boring as some people say it is, and Dillinger’s appearance of fortuitous invincibility was, after all, an illusion. At a visceral level it’s always fun in a depression to see big banks treated with the contempt they deserve. As you see pretentious senior bank managers haplessly fumbling in terror to open the safe for Dillinger, people this side of the pond can think Fred the Shred. I hate to admit it, but the sight is sweet. For overseas readers, Fred is the real-life character who walked into a bank and got away with several million in a way Dillinger could only dream about, and was rewarded with a knighthood and pension on a desert island. But that’s another story, too improbable for a movie. when the movie will be in cinemas? It should be round the UK most places next week if not now. It was in Cineworld Wycombe a couple of days ago (they change the flix Fridays). It may have been one of those public preview showings, but I don't think it was, because it was in more than one screens.